At Apex Social Club, the Super Bowl isn’t just a day – it’s an entire weekend. Our Big Game weekend features big name entertainment and, of course, amazing drinks. With 2019 off to a big start, you won’t want to miss this huge event. Check out everything that awaits you here at Apex. 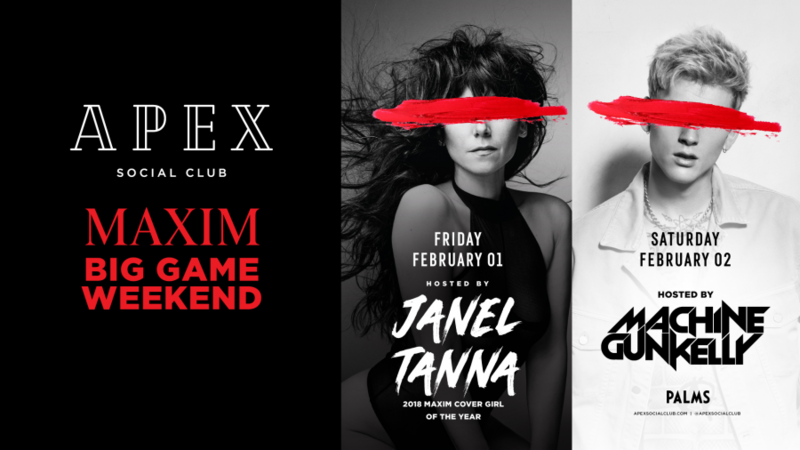 Start the weekend off right with our Big Game event hosted by MAXIM 2018 cover model Janel Tanna. Plus, DJ Mike Attack will be playing high-energy tracks all night long. Janel Tanna beat 30,000 other competitors in MAXIM’s 2018 cover model contest. Her cover was shot by Gilles Bensimon and will appear on MAXIM’s January/February issue. Tanna will now become a MAXIM ambassador and will be invited to all of the company’s red-carpet events. Tanna is much more than just a pretty face. She’s a medical school graduate and has worked in neuroscience. Tanna studied acting at the Lee Strasberg Theatre and Institute and has launched film and modeling careers. As for DJ Mike Attack? He’s been a DJ for eight years and launched his career at the Beauty Bar LV in downtown Las Vegas. DJ Mike Attack is highly influential in the Las Vegas Indie Electro Scene, and is known for his ability to do live remixing and truly manipulate music. His knowledge of both sound and lighting allows him to make all of his events truly unique. DJ Mike Attack performs at some of Las Vegas’ hottest nightclubs, including Apex. After partying with us on Friday, come back for another great night on Saturday with Machine Gun Kelly. Born in Houston, Texas, Machine Gun Kelly earned his stage name because of his rapid-fire lyrics. His first four mix tapes – Stamp of Approval, Homecoming, 100 Words and Running, and Lace Up – rocketed him to fame, and today you probably know him for such hits as “Rap Devil,” “Wild Boy,” “Bad Things,” and more. Today, Machine Gun Kelly is considered to be one of the most versatile and fastest rappers. He’s collaborated with incredible talents including DMX, Lil Jon, Mike Posner, The Madden Brothers, and Roscoe Dash, even though his career is still relatively young. You can be sure that his appearance at Apex will be full of great, high-intensity music. Machine Gun Kelly is appearing at the Pearl Theater before he heads over to Apex. When you join us on February 2nd, you’ll have a rare chance to see him up close and personal in a small, intimate venue. Don’t miss this chance to see superstar talent on an amazing weekend. We’ll follow up an epic Friday and Saturday with the big event – the big game. Join us on Sunday, February 3rd for the Super Bowl After Party. DJ Shift will be spinning all night long, and we’ll be serving up amazing cocktails of course. Not only are we bringing you over-the-top entertainment on our Big Game Weekend, we give you the chance to experience this amazing weekend as a VIP. When you make a Bottle Service reservation, you’ll take things to the next level for your party. With our VIP Bottle Service, you and your guests will be welcomed right into the club – no waiting in line – and from there, you’ll be escorted to your own private area. This area will have the best views of the club where you can see and be seen – and you can bet that others will take notice of your special status. During the night, you’ll have your own private staff including servers and security. Your bottles will be brought right to your table with complimentary mixers, so you can mix your own drinks and never have to stand in line at the bar. Bottle Service is the perfect way to make our Big Game Weekend truly unforgettable for your group. Packed with high-energy entertainment, our Big Game Weekend is an event that you can’t miss. Be sure to get on the Guest List now – these events are certain to fill up fast.